On 2nd November 2018, the Prime Minister of India launched schemes for Micro, Small and Medium Enterprises (MSMEs) which he termed as the Diwali gift for the hard working honest entrepreneurs of India. It was termed 'Support and Outreach' initiative for MSMEs. The initiative was launched for 100 districts to be continued for 100 days. MSMEs are important for the growth story of India. There is no certain way to measure the number of MSMEs. The numbers given out by various agencies varies from 60 million units (CII) of operational MSMEs to 120 million units (NSSO). They are supposed to contribute around 7% to the GDP through manufacturing activities (share of manufacturing in GDP is around 26% in India), and 25% to GDP through services (share of services in GDP is around 58%). MSMEs contribute around 40 to 45% in total exports from India based on various reports. This number too has unsure origins. Nevertheless, even with the data inaccuracies, there is no doubt that MSMEs contribute in a big way as these cover all the mom and pop businesses in the economy. The unfortunate part is that they are not adequately covered under the Goods and Services Tax (GST) and therefore we cannot expect the GST returns to cover them for raw data purposes. 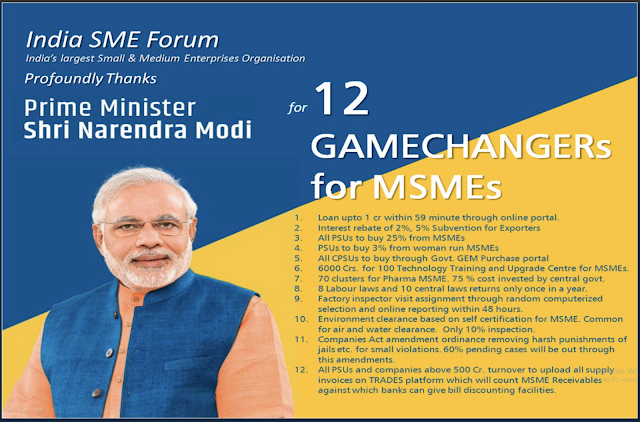 The prime minister launched the so called twelve initiatives to support MSMEs in India, and termed them as his Diwali gift to the MSMEs. It is a known fact that demonetisation and GST has adversely affected this sector and given the approaching elections it was important to address this issue at the earliest. In addition, the credit squeeze the banks are facing in the light of Non Performing Assets (NPAs) hitting the balance sheets is hurting MSMEs the most. However, what came as a surprise is that none of these initiatives, barring an interest subvention and some ease of procedures, adds anything significant to the lives of MSMEs. Interest subvention is a kind of subsidy and any subsidy is a sure shot political winner at any point of time, albeit at a great cost to the taxpaying public. However, what's moot is how much these initiatives would actually help MSMEs in surviving the downturn and actually grow. The most celebrated of the initiatives was the 'loan under 59 minutes' scheme where MSMEs would get 'in-principle' approval for loans under 59 minutes when they apply through a dedicated web portal (www.psbloansin59minutes.com) developed for the purpose. This portal works by linking the MSMEs with the GST portal and bases its credit worthiness on GST returns, income tax returns on owners, bank statements of last six months and other KYC details. MSMEs who file regular GST returns and have good income tax return profiles of the owners constitute a small minority among the MSMEs. This minority never faced credit crunch in the first place. So one wonders which MSMEs pain is this initiative trying to ease. And the in-principle approval by the public sector bank is only 'in-principle'. One still has to visit the bank physically and submit all relevant details in paper form again to the bank for final approval which would take more than a week. The pain lies in the approval process. Given the credit squeeze the banks are facing, and the fear of enquiry the bank managers face if a loan goes bad, the banks shun lending to anything even slightly risky. While not entirely new, some initiatives are laudable. Various clearances such as separate water and air pollution clearances have been merged into one, and this can be now based on self-certification for a majority of MSMEs that don't fall in hazardous material zone. Also, the bill discounting through TReDS platform, which is in place for more than a year, is also a good move. Overall, while there was nothing new in the announcements apart from the interest subvention, the PM did a good job in enumerating the steps taken towards ameliorating the pains of MSMEs. I was one of the officers in my area who was given the task of inviting the MSMEs to come and listen to the announcements being made for them through video conference. A union minister was also deputed along with a senior officer from Delhi to overlook the preparations. The convention hall was filled up with bank employees (banks were the main coordinators for the program) and random public who were hauled up in the last minute to ensure that the hall doesn't look empty. As the video conference began, the snacks arrived, and with it most of the public vanished. By the end of the announcements, there were only few rows of bank employees, government officials, and a few uninterested press reporters who were left. Of course, there were some MSME owners among us who wondered what's all the fuss about.